Today, we’ll run a “Toto’s special” ! Toto is a mischievous school age kid and his jokes as super popular in France. Listen to the French audio recording of the jokes and check the English translation. “Toto” jokes have been part of the French culture for a while. “Toto” is a young school boy, an impertinent dunce, who talks back and is lazy but usually not mean – I believe his name would be “Little Johnny” in English. Most jokes revolve around school, homework, talking back to adults and are very short and use colloquial language. They are very popular jokes among elementary school children, and there are thousands of them. “Toto” is always represented with this drawing : zero + zero = la tête à Toto !! (0 plus 0 equals Toto’s head, see drawing above). 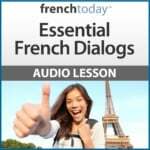 You’ll find more Toto joke with audio in these posts on French Today, although you’ll also find some scattered through the whole series! – “il est sous mon banc”. – Et ton bulletin, il est pas encore arrivé ? – Si, si, répond Toto, mais je l’ai prêté à Paul pour qu’il fasse peur à son père ! – Ma mère m’a puni pour une chose que je n’ai même pas faite. – Ah oui ? Qu’est-ce que c’est ? I didn’t do anything ! – My mom punished me for something I did not even do. – Oh, really? What’s that?